Merk Insights - Dollar Cliff? 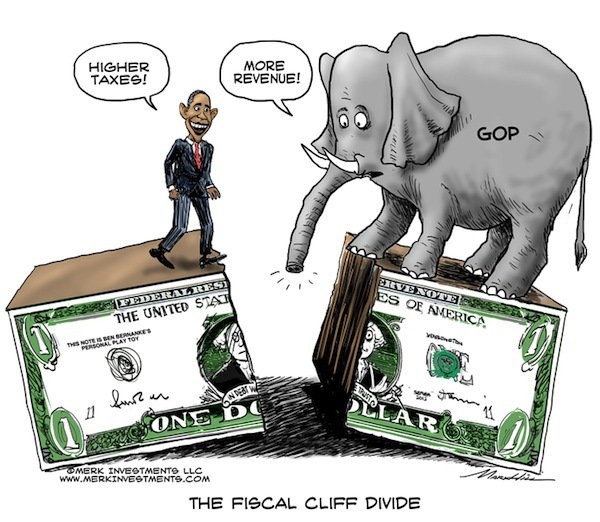 As election euphoria settles and the "fiscal cliff" approaches, what are the implications for the dollar? Even as federal deficits may be unsustainable, stocks and bonds are up, and while the dollar may have resumed its long-term downward trend, the greenback has hardly fallen off a cliff. We look at how different tax policies might affect the U.S. dollar. In our assessment, the fiscal cliff, that is the looming simultaneous tax increases and spending cuts, is mostly a distraction. It's a distraction because, as significant as the short-term impact on GDP may be, "going over the cliff" does not solve our long-term fiscal problems. Indeed, we might as well call it European style austerity, as before factoring any slowdown induced by the cliff itself, the U.S. would continue to face a deficit exceeding 3% of GDP. More importantly, Medicare reform, in our view key to long-term budget sustainability, remains elusive. The most attractive attributes of the dollar may well be its liquidity. A side effect of issuing record amounts of debt is that central banks have a place to deploy their dollar reserves without impacting markets too much. However, the Federal Reserve (Fed) may be crowding out other investors, as it gobbles up an ever-growing chunk of federal debt, in an effort to keep down U.S. borrowing costs. Still, the Fed has shown its willingness to provide liquidity in times of crisis, providing comfort to many. And while we take it for granted, the ability to take one's money out of the U.S. is also a key reason why investors put money into the U.S. The best thing that could happen to global financial stability is if emerging markets opened their capital accounts and developed their domestic fixed income markets, making them less dependent on U.S. dollar funding. Instead, policy makers from Brazil to Switzerland that are afraid of speculative inflows impose roadblocks, then engage in ill-fated efforts to manage the fallout from their policies. Countries might be better served preparing their economies for a world where the dollar is no longer the only game in town, rather than deploying billions to provide the illusion of a world order that we believe won't come back. Like any asset, currencies are driven by supply and demand. Investors buy U.S. dollar denominated assets if they believe they get a worthy return. Because the U.S. has a current account deficit, the greenback has a continuous uphill struggle: foreigners must buy U.S. dollar denominated assets to pay for U.S. deficits: all else equal, the current account deficit is exactly the amount of U.S. dollar denominated assets foreigners must buy to keep the dollar from falling. In turn, the dollar may benefit when the U.S. is an attractive place to invest in; in many ways, this explains why the U.S. is always in search of growth. In contrast, the Eurozone's current account is roughly in balance and as a result austerity and any accompanying economic slowdown, even select government defaults, are not ex-ante euro negative. Conventional wisdom suggests low taxes and low regulatory overhead attract investment. To an extent, we agree, but even more important than tax rates and lax regulations may be clarity on taxes and regulations. Businesses want to know what the rules are going to be. Silicon Valley, for example, has long been able to attract capital despite high tax and regulatory burdens. Similarly, Europe has some very competitive businesses despite the tax and regulatory overhead. Ultimately, regulations increase the barrier to entry, protecting large established firms, but stifling innovation from small business. High taxes may foremost influence new capital deployment. Before someone thinks we praise high taxes and regulations, let's keep in mind that Silicon Valley has increasingly been losing out to competition from other states. The challenge is that the backlash from high taxes and regulation is a slow one, giving policy makers the illusion that their policies may not be causing any harm. In the context of current U.S. policies, the uncertainties created by Congress relating to the fiscal cliff are not helpful. Neither is it helpful that massive regulatory initiatives, from healthcare to financial "reform" create more questions than they answer; the only certainty is that adherence to the new policies will create substantial cost. Competition is not national, but international. Whereas the French try hard not to get any investment dollars from abroad, Singapore has an active outreach to attract businesses. What Singapore understands is that resting on one's laurels is not an option. Similarly, the U.S. would do well not to ride on past glory when investors sought out the U.S. dollar because of prudent policies. Offering "the most liquid markets in the world" alone is not a long-term recipe for success. In our view, it is also not helpful for the U.S. to rely on the greenback's status as a reserve currency, rather than fostering policies that promote its status as a reserve currency. One tax policy with significant dollar implications is the taxation of earnings that are repatriated by US companies. While it may make good politics to talk about corporations paying their "fair share" (one of the most abused and overused catch phrases in politics), it should be apparent that punishing those taking money back home makes little sense from a policy or dollar point of view. Cash rich companies borrow money in the U.S. because much of their cash is sitting abroad. The periodic lowering of the tax is also counter-productive, as it encourages more hoarding abroad; just as with any policy, predictability is key: abolishing the tax to repatriate earnings is, in our assessment, one of the more prudent policies that could be pursued to support the greenback. More generally speaking, policies that foster savings and investment may be needed to reduce the dollar's vulnerability by reducing the U.S. current account deficit. Trouble is that such policies may impact short-term growth and, as a result, tend to make for good speeches, but rarely are implemented into actual policies. The most obvious here is to tax consumption with a national sales or value added tax and reduce or replace income and capital gains taxes with revenues from these new taxes; an energy tax falls into the same category. Democrats don't like it because they consider it a regressive tax; Republicans don't like it because they think such a tax would give the government a license to spend. The fair tax movement (again, fair!) that seeks to abolish the income tax system with a national sales tax may have all the right motivations; but we shall caution that our understanding of policy dynamics suggest that we would end up with both income and national sales tax should the idea gain traction. It is, by the way, possible to structure a national sales or value added tax to be progressive: Vic Fuchs, Professor Emeritus at Stanford, has promoted a value added tax where proceeds are used to pay for national health care coverage. By clearly identifying and capping benefits, high spenders would pay more into the system than they receive. This may well be a back-door way to introduce a national value added tax at some point. And once introduced, it may well morph into something bigger. As it stands, however, the U.S. tax system is hopelessly out of touch with that of the rest of the world. Europe has learned that individuals can be taxed rather highly before they move, but corporations must be lured with low taxes. As far as the dollar is concerned, we consider the current tax system a negative for the dollar; prudent tax policies could promote the dollar. But the tax system itself may not trigger a "dollar cliff". The bigger concern is on the spending side, as any tax system may fail at some point when spending far exceeds revenue. The fiscal cliff discussion is, in our assessment, about merely tweaking spending. Meaningful entitlement reform is, in our view, the most important factor driving long-term fiscal sustainability. However, as Europe has shown us, the only language policy makers appear to understand is that of the bond market; as long as the bond market lets policy makers get away with excessive spending, we see little chance entitlement reform is tackled in earnest. As such, the risk of a dollar cliff may stem from the bond market acting up to provide "incentives" for reform. Because the U.S, unlike Europe, has a current account deficit, the dollar may be far more vulnerable should the "bond vigilantes" impose reform. "Bond vigilantes" is a term used to refer to a bond market selloff that imposes reform. On that note, we don't need horrible news for such a selloff to happen: good news might do the same. Should the economy recover, the bond market may turn into a bear market. In such an environment, foreign investors that historically favor U.S. Treasuries might reduce their holdings, causing downward pressure on the dollar. In our assessment, the biggest threat to the bond market - and with that to the dollar - is neither good nor bad news, but a return to historic levels of volatility in the bond market. A lot of investors that have chased yields might all run for the exit at once should sentiment spread that U.S. bonds might be a bit pricey. To learn more about the dynamics for the US dollar, please join us for our upcoming Webinar on Thursday, December 13, 2012. Please also sign up for our newsletter to be informed as we discuss global dynamics and their impact on gold and currencies.